Varna lies on the same latitude of the famous Atlantic resort of Biarritz in France, but possibly enjoys a climate that's even better. During the holiday season, July and August, the sun shines for an average of 10-11 hours per day. And the temperate climate means that it never gets too hot or cold, which is, of course, perfect for golf. Varna is rated 5.0 out of 5 based on 1 verified reviews from YGT customers. They played and stayed (we even checked they signed their scorecards). Some 30-40 kilometres north of Varna, is a growing cluster of world-class golf facilities, most being established around the ancient and picturesque town of Balchik on the Black Sea coast. 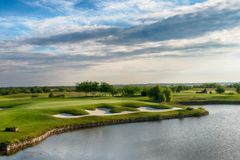 Gary Player is behind the courses at the BlackSeaRama Resort and Thracian Cliffs while Ian Woosnam has signed off a brilliant layout at the Lighthouse Resort nearby. Both are within five kilometres of Balchik, famous for its palace, built by Queen Maria, with its complex of unique botanical gardens. It's a great area for a golf break, with many restaurants in downtown Balchik, offering just about every cuisine imaginable. There are numerous taxis, buses, and boats to other beach resorts on the Black Sea. They include the large resort of Albena, with its white sand beaches, hundreds of restaurants, water sports, casinos and nightclubs. Golden Sands, meanwhile, less than 20 kilometres from Balchik, is famous for the purest sand on the Black Sea coast, and a little further away, towards Varna, there's St Konstantine, which combines ancient history with the modernity of a popular tourist resort, all set in the midst of a beautiful natural park. All in all, this is a very attractive and, as yet, undiscovered holiday region that is set to become increasingly popular with UK holidaymakers, especially golfers.